Growing up in Wyoming is unlike any place else. Here there are boundless blue skies, heavenly-high mountains, and plenty of room for your imagination to run wild. In sixth grade, Gabe and his family moved to Gillette, Wyoming. It was in Gillette where Gabe says he was “really able to develop my artistic talents in the arts programs” at school. Also, [I] was fortunate to have some of the best art instructors you are likely to find in public education.” Gabe continued, “I had Mike Plourd as a teacher at Sage Valley Jr. High, and Christopher Amend at Campbell County High School. Both very talented artists and great mentors.” With this artistic spark and his support at home, Gabe decided to pursue his passion in arts. Halfway through his senior year of high school, Gabe’s parents were transferred to Virginia. He chose to stay in Wyoming with friends to complete his last year. Then at the age of eighteen, three days after his high school graduation, he set off for Columbus College in Ohio. His choice in school was simple, Columbus had offered him the largest scholarship and the added perk of having his parents a mere 300 miles away in Virginia. Once graduated from CCAD, Gabe headed out west for Los Angeles, California, where he still resides today. When he saw other artists selling their work along the Venice Beach walk, it clicked for him that he could carve out a living from his passion. From the sunny beachfront to bustling street festivals, Gabe worked tirelessly to create a name for himself. Eventually graduating from the street festivals, Gabe entered art specific festivals and shows; this is when the art collectors began calling to ask about purchasing his art. So much so that he ended up recruiting help for his art sales and management. Fast-forward to today, he is now a world-renowned artist. 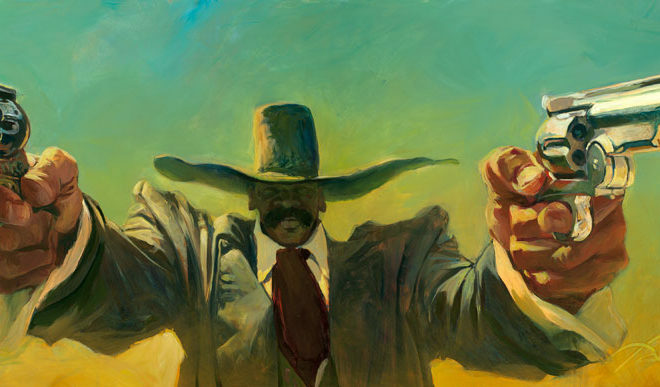 Gabe sells his paintings in the U.S. and the U.K. His distinctive themes of the American West, movie icons, musical legends, and strong characters, have caught the eye of some pretty high profile fans. For instances, does the name Quentin Tarantino ring any bells? When Gabe received the call that Tarantino’s business associates were looking to gift the award-winning filmmaker with one of Gabe’s pieces, he was thrilled, to say the least. But what does an artist create for the one and only Quentin Tarantino? Gabe decided to take a limited-edition print on canvas of Double Fist and add “some extra hand painted smoke and blood splatters,” calling it the Rated R Version of Double Fist. This piece is one all Tarantino fans can appreciate. With creative inspiration coming at Gabe from all aspects of his life, he finds most of his inspiration after he begins the artistic process. He explains, “Creating a painting is often like solving a puzzle in that you’re not exactly sure what it’s supposed to look like when it’s finished.” One of the most difficult tasks as an artist, such as Gabe, is trying to decide when one of his “puzzles” is complete. Over the course of one year, Gabe can see through around 65 original works of art. Depending on size and complexity of the painting, one piece can take him anywhere from three hours to several weeks to finish. This past February, Wyoming Art & Frame in Gillette hosted the Gabe Leonard Artist Reception, where he featured one of his latest pieces, “Persist.” He makes the pilgrimage back to Wyoming every two to three years and usually ends up spending most of his time in Gillette, though he often tries to make it out to one his other favorite Wyoming towns in the gorgeous land of Thermopolis. Luckily for Gabe, and for all of us as admirers of his work, he wasn’t talked out of being an artist. To his fellow dreamers wanting to one day succeed in an arts career – Gabe’s message is to, “Start now. Keep doing it. Don’t give up. Don’t have a backup plan.” Art lovers everywhere, from Wyoming to California from Asia to the U.K. are certainly glad Gabe kicked off those snow boots and kept running to chase his dreams. At www.GabeLeonard.com, find locations where his work is sold, see him in action creating some of his most famous pieces, and learn more about the incredibly interesting and talented Wyoming native, Gabe Leonard.